One of the biggest complaints couples have is collecting RSVP's and it comes at the most stressful end of the wedding planning process. Here are a few do's & don'ts to help you keep sane and get those RSVP's in on time. When sending your invitations you want to send them 3-5 months prior to the wedding, any longer and they will probably get lost behind all the other 'fridge paperwork.' This is why it's great to send 'Save The Dates' when you need to give guests more notice for booking flights and accommodations and then follow up with the invitation closer to the wedding date. You want to also ensure that you have a definitive date to RSVP and that you give the guests enough time between receiving the invitation and having to respond. We think 4-6 weeks prior to the wedding date is a good time for your RSVP date. 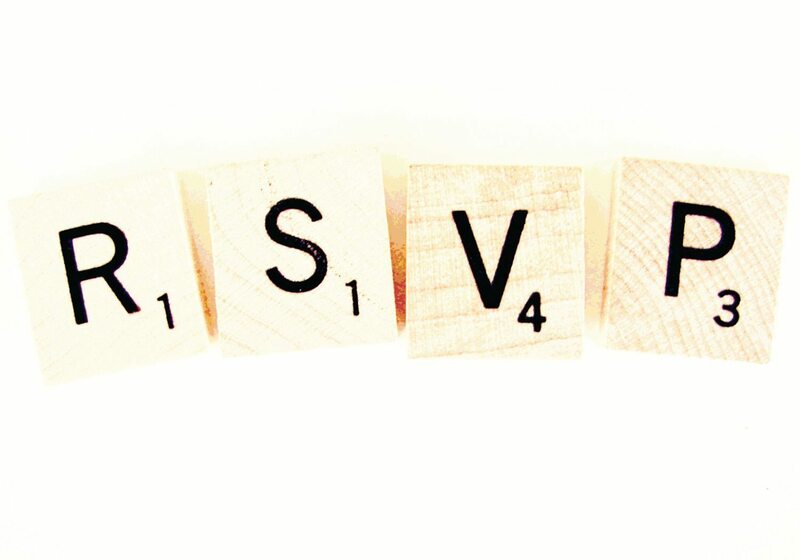 If you are including an RSVP card in with your invitation it is good etiquette to include a return envelope with postage paid, this also garners better results in RSVP returns. What you don't want to do is offer 3 different email addresses and 2 phone numbers to RSVP on as you may lose track of RSVP's when they start coming in. An email address is great as you can keep them as a record to look back on. Make sure you have a list of all your guests, how many were invited from each invitation and if and when they RSVP or decline the invitation note it on the list. A notebook in your handbag may work best for you or perhaps sending yourself an email when someone calls in to RSVP is your style. Whatever it is, note it down when it happens. With everything else going on you just might forget. Perhaps over dinner once a week you can have the 'RSVP conversation' and check in with each other who has RSVP'd and check it's been noted down. This is also a good time to think about those in your life that you might be seeing that you can give a gentle reminder to. I'd say give them 3 days grace period before making calls but more than likely they have had in excess of a month to RSVP so do not feel bad about contacting them and asking for their answer. DON'T let people walk over you. I don't know why people think it's OK to tell couples that they are yet to decide to attend their wedding or to oganise childcare for example but it's not OK. Don't feel like you can't put your foot down to get an answer and simply tell them that if they can't respond by the end of the week (give them a deadline) then it will be assumed that they won't be attending.